Belmont is a residential suburb 3 km south-east of central Geelong. It is bounded on the north and east side by the Barwon River and the riverside Belmont Common, on the south by Waurn Ponds Creek and on the west by Highton. The site of Belmont was settled by Dr Alexander Thomson in 1836. Thomson, a pioneer preacher and pastoralist named his holding Kardinia, and his Kardinia homestead (1850) in Riverview Terrace near the river is on the Register of the National Estate. Thomson was Mayor of Geelong five times between 1850 and 1858. 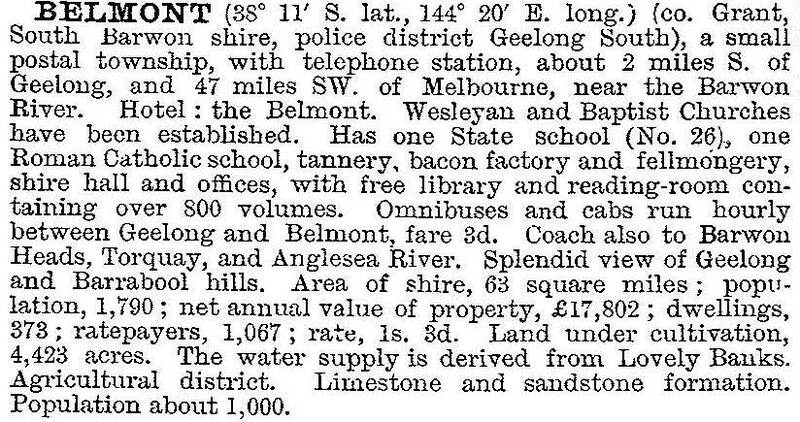 The area now comprising the Belmont Common was a lagoon, and Thomson's Kardinia homestead was situated on the edge of rising ground. Westwards the ground rises towards the Barrabool Hills, which may be the source of the name of Belmont, a word of French or Italian origin for a fine or pretty hill. In 1861 the Belmont town was proclaimed as a settlement south of the Barwon River, and in 1862 the Princes Bridge opened, connecting the Colac road (Princes Highway) to Geelong. By 1865 Belmont had three hotels, a flourmill, tanneries, fellmongeries and a court of petty sessions. A Catholic school had functioned during 1856-63, and a National School opened at the same time continued. It became the State primary school. Much of the surrounding land was agricultural, including orchards, vineyards and market gardens. Limestone was quarried. The offices for South Barwon shire (1875) were opened in Mt Pleasant Road, Belmont. The town centre remains south-west of the intersection of Princes Highway and Mt Pleasant Road. Belmont Common was the site of the landing of an aeroplane piloted by Captain Bert Hinkler in 1928, and an aerodrome was laid out on its north-west section. A tram service from Geelong to Belmont was opened in 1927, and ceased in 1956 along with all the Geelong trams. Before World War II there were fewer than 3000 people in Belmont and by 1980 the population was estimated to be 15,000. Until 1936 the shopping centre on High Street (Princes Highway) was small, but a Harry Hooper grocery (later a supermarket) attracted retail development. A Dickens grocery opened later, culminating in a Coles New World supermarket. Kmart opened a drive-in centre immediately to the north in 1970. This development coincided with strong increases in traffic, particularly heavy vehicles, putting pressure on the shopping centre's amenity. Further south on the Princes Highway, there was a CSIRO textiles research centre (1958-2010). By the early 1950s the tide of suburban growth was well upon Belmont. A second primary school was opened in 1951, a high school in 1955, and community facilities were established. The Belmont Common, now without the aerodrome, has a golf course, numerous ovals, a wildlife reserve and an active Sunday market. Near Kardinia House (a Salvation Army children's home) there is Barwon Valley Park and several caravan parks. Waurn Ponds Creek has a linear park. The Belmont residential area, however, has few neighbourhood reserves.